Why most Common Cleaning Products Are Not Good. Most cleaning products spend more time on their product than on designing a long-term solution for their customer. Why would we say that? A long-term solution should neither leave behind a residue nor contain damaging, harsh chemicals. It only makes sense that a cleaner should be surface safe, and not contribute to contaminating the surface, else we are just kicking the can a bit further down the road, as we create a more difficult problem to solve. Focus is the development of solutions that work without creating downstream problems. We design products that are easy and worry-free to use . What works on tile, is not necessarily the best solution for marble or granite. Here are two questions you want to know about your cleaner? 1. Will it leave a residue? Products that leave a residue after cleaning can slowly build up a layer of sticky, gloss dulling impurities. We see this with micro-wax containing products which are designed to “fill-in” micro-scratches on glass. Well if designed to stay behind on glass, they stay behind on other surfaces as well. These pesky deposits are invisible until you notice that your gloss is fading. Now you need a more aggressive treatment to remove this build-up, which was designed to remain behind intentionally. Other products focus on dissolving the oils that make a surface sticky and trap dirt. Once the oil is dissolved the visible dirt is removed as well, but if the initial chemistry is not properly balanced it is left behind to become a downstream sticky problem on its own. This is common in the carpet cleaning industry where excess soaps leave a clean but sticky residue allowing the carpet to trap and hold onto the dirt faster. Not bad for the carpet cleaner as he has to come back more frequently. Cleaners can see a similar effect, actually increasing their own need by leaving behind a dirt attracting residue. That is simply not playing fair. The difference is that these particulates are designed to remain after cleaning or leave a dull film behind. They are designed to be so comfortable in water they are easy to remove, dramatically reducing streaking, and leaving behind no sticky residues. In fact, when using cleaner to clean floors, your mop water will stay visibly cleaner as the dirt is surfactant surrounded and dropped to the bottom of the bucket in order to keep the water you are working with cleaner. This effect is so strong that you can actually separate water from dirt just be using gravity. On your counters this same technology finds and surrounds each oil particulate with a water-loving surfactant such that the water can no longer see the oil, but can see a surfactant that loves to be in water. This allows oil based dirt and oil to be lifted into solution and removed from the surface quickly and easily. Its ability to bond to the surface having been neutralized and allowing it to be wiped clean with ease. Nothing is designed to remain behind, and everything is engineered for ease of removal with a wipe of the hand. 2. Does it contain acidic chemicals? Vinegar has been recommended as a cleaner since the Roman times, however today we recognize that acids have damaging effects on grout and sensitive stone such as marble and surfaces such as concrete and terrazzo. Ever seen the pickle aisle of the local grocery store after someone drops a bottle? It burns a spill mark into the polished concrete or terrazzo that will require re-polishing to grind out as the acid has literally dissolved away the surface of the floor. Acids will leech out the dyes used to color your grout. In fact, it is not uncommon for people to confuse the lightening of their grout color with it being cleaner, when in fact it is literally lighter, and continued use will slowly return the colored grout back to an un-dyed or colored natural gray. Used on marble, it will slowly etch away the glossy finish as it dissolves micro holes into what was a mirror flat ground surface. A couple years back 20% of residential restoration work was linked to the mistaken use of calcium hard water dissolving cleaners such as CLR on marble, which is coincidentally also made of calcium. These issues can be restored but require a professional stone restoration craftsman. Make sure that any cleaner you use indicates that it is acid-free and marble safe. (So how does one remove hard water deposits from a marble surface – very carefully. A surgical approach is preferred to a general attack. Even then one is better to approach with a razor blade than with an acid). The alternative is to use a stone safe product formulated for regular cleaning of marble, granite, travertine, slate, terrazzo, concrete and other types of natural and man-made stone. MARBLELIFE’s Stone and Tile Floor Cleaner goes where others can’t, employing surfactant technology, to penetrate deep into the minute pores of your floor or counter-top surface to flush out dirt and oil where it hides. This doesn’t just get it clean, but keep it clean longer. How can we say that? Understanding the science of dirty surfaces teaches us that dirt on its own is mobile, but when it encounters an oil that same dirt gets stuck and sticks to the surface. Eliminate the oil and the dirt is free to blow by or simply sit as dust. Understanding how oils behave is the next element. Oils tend to spread out. If you have a reservoir of oil in a depression it will climb the sides and spread out on the upper surface where it can attract dirt. If you can only wipe off the upper surface and cannot penetrate into the depression you only remove the upper film. Once done, the oil re-equilibrates and sends fresh material out to spread across the upper surface. The ability to break the water tension and allow it to enter this depression where it can solubilize the oil and flush it out breaks this cycle and eliminates that reservoir once and for all (another reason for sealing your floors). The net result is your surface remains cleaner longer. MARBLELIFE’s Cleaner delivers non-acidic detergent and surfactants to dissolve oils and debris trapped inside and floating them out where they can be wiped or mopped away – streak free. It is popular today to have two or more different functions in one product such as Cleans & Disinfects or Cleans & Shines. Sounds great, but when one analyzes what this really means, it quickly becomes apparent that this “feature” may create other problems. The problem is that in most cases this does not work. We will use the example of cleaning granite counter-tops. The goal is to remove the oils from the surface to have a clean surface. While polishing or conditioning granite counter-tops you want to leave a safe oil behind that will bring out the granite’s shine. Combining both these products creates a problem. You might remove dirt but you are depositing an oil to cover imperfections that will return as the oil evaporates. The cleaner is trying to remove the oils and the oils in the cleaner is trying to stay to leave a beautiful shine. How could the product in the bottle know which oils to take and which oils to leave behind? The truth is, it can’t. The result will be a residue and not a clean surface. The same thing happens with cleaners and sealers. And on and on. A quality cleaner should do its best to clean and a polish should do its best to polish. These are not the same process and not the same product. Better to have the blemish addressed once, and then maintain your beautiful surface. This will result in a much longer quality appearance that is easier to clean, and does not contain some mystery oil to interact with your food and little one’s fingers. We want a true clean surface. 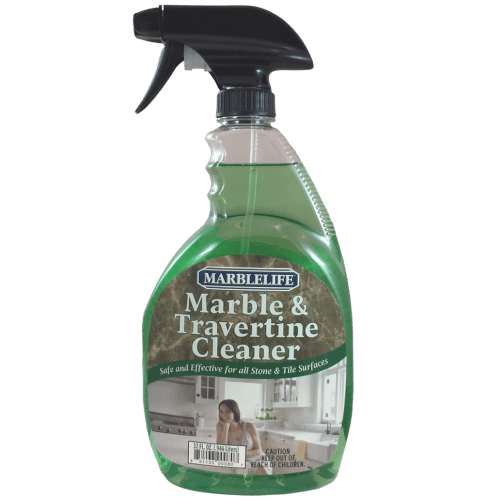 Rather than combine products that will not give you the best results, first use a quality stone safe cleaner like Marblelife’s InterCare Cleaner. If your surface is in good shape this will allow the natural finish to shine through. If it needs some assistance or has etch marks, call MARBLELIFE and we will restore your surface, so that you do not need to introduce a product to your surface. If time is of the essence, and you absolutely must have a shine on your surface no, condition the stone with a professional grade stone conditioner. MARBLELIFE® Marble Gloss Conditioner is a great way to add a richer look to the stones color and shine. This product will indeed enhance your gloss. However, for best results we encourage you to contact your MARBLELIFE service provider, you’ll be amazed at the results. We love to show off that way. Our craftsman love wowing their clients. When caring for natural stone such as Granite, Marble and others there is an order to things which helps to assure the best care possible based on the stones longevity and appearance. First – Clean the stone regularly. Second – Repair the stone if needed, such as repairing chips and crack and removing etches and stains. Third – Seal the stone to help protect against stains and to help make cleaning easier. Remember you need to address your stains first else you are setting them in. Lastly – Conditioning to help bring out the stone’s best appearance, if needed and time is of the essence. 1) Cleaning should be done regularly between daily to weekly. 2) Sealing should be done bi-annually, every two years. 3) Repairs should be done as needed and a promptly as possible. 4) Conditioning can be done as desired between monthly and just on occasions. Again these are very general intervals to help give some frame of reference.